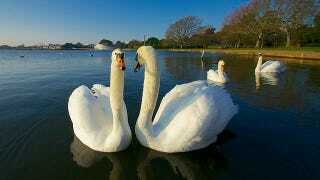 Swans: elegant symbols of romantic love or terrorizers of plants, small children, and airplanes? The non-native mute swan has been wreaking enough havoc in New York City that the state's Department of Environmental Conservation wants to declare it a "prohibited invasive species." By 2025, under the proposed plan, there will be virtually no more wild mute swans in all of New York. "The mute swan is a nuisance and an invasive species," the department's spokesperson, Lori Severino, told me. The birds rip up underwater vegetation, which disturbs the habitat for fish and other waterfowl. Their poop contributes to bacteria in the water. The huge birds can get caught in jet engines. On top of all that, the species is an especially aggressive protector of its nests, attacking other birds and even people. In the New York Times, an Audubon Society member recounts the time she had to fight off a mute swan with a paddle: "It was hissing like crazy and tried to get in the canoe with us." Eliminating the mute swan from New York will required a lot more than a canoe paddle. Under the proposal—which is open for public comment until February 21—the birds will either be shot or captured and gassed. To keep them from breeding, their nests will be disturbed and their eggs oiled to prevent them from hatching. All this has left some members of the public uneasy. The Department of Environmental Conservation is keen to get the word out about how destructive the usually romanticized creatures really are. They also want to clear up a misconception: native trumpeter swans and tundra swans in New York will be unharmed under the proposed plan. "It's getting a little publicly misconstrued," said Severino, "It's not all swans."